Здесь вы можете прочитать биографию Владимира Маяковского на английском языке. Vladimir Mayakovsky (19.11.(07.11. O.S.) 1893 - 14.04.1930) - Russian poet. He was born the last of three children in Baghdati, Georgia where his father worked as a forest ranger. His father was of Cossacks and Russian descent while his mother was of Ukrainian descent. Although Mayakovsky spoke Georgian at school and with friends, his family spoke primarily Russian at home. At the age of 14 Mayakovsky took part in socialist demonstrations at the town of Kutaisi, where he attended the local grammar school. After the sudden and premature death of his father in 1906, the family — Mayakovsky, his mother, and his two sisters — moved to Moscow, where he attended School No. 5. 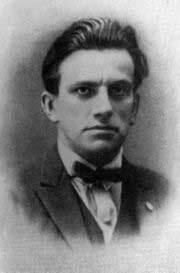 In Moscow Mayakovsky developed a passion for Marxist literature and took part in numerous activities of the Russian Social Democratic Labour Party; he was to later become an RSDLP (Bolshevik) member. In 1908, he was dismissed from the Grammar School because his mother was no longer able to afford the tuition fees. Around this time, Mayakovsky was imprisoned on three occasions for subversive political activities, but being underage, he avoided transportation. During a period of solitary confinement in Butyrka prison in 1909, he began to write poetry, but his poems were confiscated. On his release from prison, he continued working within the socialist movement, and in 1911 he joined the Moscow Art School where he became acquainted with members of the Russian Futurist movement. He became a leading spokesman for the group Gileas (Гилея), and a close friend of David Burlyuk, whom he saw as his mentor. The 1912 Futurist publication, A Slap in the Face of Public Taste (Пощёчина общественному вкусу) contained Mayakovsky's first published poems: "Night" (Ночь), and "Morning" (Утро). Because of their political activities, Burlyuk and Mayakovsky were expelled from the Moscow Art School in 1914. His work continued in the Futurist vein until 1914. His artistic development then shifted increasingly in the direction of narrative and it was this work, published during the period immediately preceding the Russian Revolution, which was to establish his reputation as a poet in Russia and abroad. A Cloud in Trousers (1915) was Mayakovsky's first major poem of appreciable length and it depicted the heated subjects of love, revolution, religion, and art written from the vantage point of a spurned lover. The language of the work was the language of the streets, and Mayakovsky went to considerable lengths to debunk idealistic and romanticised notions of poetry and poets. In the summer of 1915, Mayakovsky fell in love with a married woman, Lilya Brik, and it is to her that the poem "The Backbone Flute" (1916) was dedicated; unfortunately for Mayakovsky, she was the wife of his publisher, Osip Brik. The love affair, as well as his impressions of war and revolution, strongly influenced his works of these years. The poem "War and the World" (1916) addressed the horrors of WWI and "Man" (1917) is a poem dealing with the anguish of love. Mayakovsky was rejected as a volunteer at the beginning of WWI, and during 1915-1917 worked at the Petrograd Military Automobile School as a draftsman. At the onset of the Russian Revolution, Mayakovsky was in Smolny, Petrograd. There he witnessed the October Revolution. He started reciting poems such as "Left March! For the Red Marines: 1918" (Левый марш (Матросам), 1918) at naval theatres, with sailors as an audience. After moving back to Moscow, Mayakovsky worked for the Russian State Telegraph Agency (ROSTA) creating — both graphic and text — satirical Agitprop posters. In 1919, he published his first collection of poems Collected Works 1909-1919 (Все сочиненное Владимиром Маяковским). In the cultural climate of the early Soviet Union, his popularity grew rapidly. During 1922-1928, Mayakovsky was a prominent member of the Left Art Front and went on to define his work as 'Communist futurism' (комфут). He edited, along with Sergei Tretyakov and Osip Brik, the journal LEF. As one of the few Soviet writers who were allowed to travel freely, his voyages to Latvia, Britain, Germany, the United States, Mexico and Cuba influenced works like My Discovery of America (Мое открытие Америки, 1925). He also travelled extensively throughout the Soviet Union. On a lecture tour in the United States, Mayakovsky met Elli Jones, who later gave birth to his daughter, an event which Mayakovsky only came to know in 1929, when the couple met clandestinely in the south of France, as the relationship was kept secret. In the late 1920s, Mayakovsky fell in love with Tatiana Yakovleva and to her he dedicated the poem "A Letter to Tatiana Yakovleva" (Письмо Татьяне Яковлевой, 1928). The relevance of Mayakovsky cannot be limited to Soviet poetry. While over years, he was considered the Soviet poet par excellence, he also changed the perceptions of poetry in wider 20th Century culture. His political activism as a propagandistic agitator was rarely understood and often looked upon unfavourably by contemporaries, even close friends like Boris Pasternak. Near the end of the 1920s, Mayakovsky became increasingly disillusioned with Bolshevism and propaganda; his satirical play The Bedbug (клоп, 1929), dealing with the Soviet philistinism and bureaucracy, illustrates this development. His final months were marked by poor health and political as well as private disappointment. On the evening of April 14, 1930, Mayakovsky shot himself.